Bazookafied é dos Estados Unidos e modifica Nerfs e Lazer Tag blasters para fins recreativos usados em grupos em Omaha, NE. 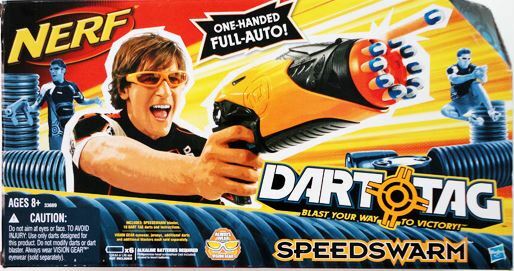 Ele começou a ser um Nerfer em 1993, quando os pais dele lhe compraram uma Bow´n Arrow e atualmente tem sensivelmente 200 Nerf e Lazer Tag blasters. 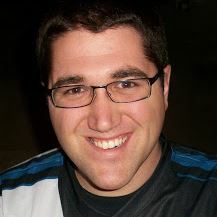 Bazookafied is from the United States and modifies Nerf and Laser Tag blasters for recreational use with local groups in Omaha, NE. He started Nerfing in 1993, when his parents bought him a Bow ´n Arrow and now owns roughly 200 Nerf and Laser tag blasters. 1ª – Qual é a tua Nerf favorita de todos os tipos (stock, modificada,…)? R: Acho que escolho a Nerf N-Strike Longshot CS-6. É óptima stock mas tem um enorme potencial que pode ser descoberto com modificações. Eu também gosto do seu ar robusto e do seu largo stock. Funciona muito bem para um homem do meu tamanho. 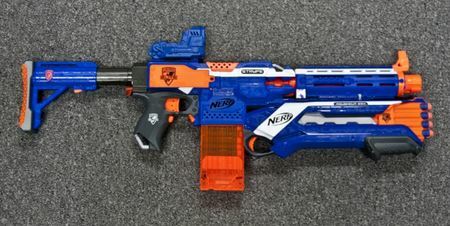 1st – What is your Favourite Nerf Blaster of all types (stock, modded,…)? R: I’d go with the Nerf N-Strike Longshot CS-6. It’s great stock but there’s a lot of potential you can tap into with modifications. I also like it’s bulky design and large shoulder stock. It works well for a guy with my size. 2ª – Qual é a tua Nerf favorita em forma stock? 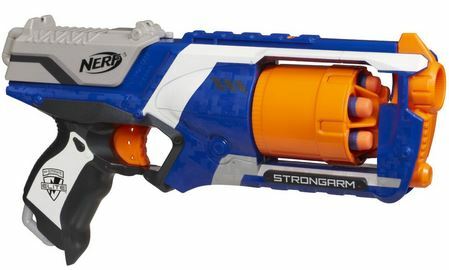 R: Provavelmente a Nerf N-Strike Elite Strongarm. Tem óptimo range, tem slam-fire, e tem um aspeto muito fixe. Não precisa de muito melhoramento. 2nd – What is your favourite stock blaster? R: Probably the Nerf N-Strike Elite Strongarm. It’s got great stock range, slamfire, and it just looks cool. Doesn’t need much improvement! 3ª- Qual é a tua Nerf favorita que está modificada? R: A minha Nerf favorita que está modificada é a minha Nerf Elite Longshot. Tem muita atenção online por alguma razão. Estou a construir uma igual porque gosto mesmo desta! 3rd – What is your favourite modded blaster? R: My favourite Nerf modded blaster is my Elite Longshot. It’s gotten a lot of attention online for good reason. I’m building a second one because I like this one so much! 4ª – Qual é a tua integração favorita? R: Na verdade não sou fan de integração. Mas se tivesse de escolher uma acho que seria a Masterkey que o Sloscud fez. 4th – What is your favourite integration of all? R: Not really a fan of integrations in general. I suppose the Masterkey that Solscud did would be my favorite if I had to pick one. 5ª – Qual é a melhor modificação que alguma vez fizeste? R: A minha Combat Bow (Big Bad Bow midificada). É a blaster com mais range que já construí até à data. 5th – What was the best mod that you ever done? R: My combat Bow (Modified Big Bad bow). It’s the most powerful blaster I’ve made to-date. 6ª – Qual foi a tua primeira modificação? R: Foi uma Namco NPC-01 Guncon Lazer Tag Recasing. Demorrou-me meses a fazer quando a construí. 6th – What was your first mod? R: A Namco NPC-01 Guncon Lazer Tag Recasing. It took me months to work the kinks out of it when I first built it! 7ª – Existe alguém ou algum grupo que te inspirou? R: Sim, Urban Taggers e Custom Tag Dynamics. Urban Taggers inspirou-me para começar o Tactical Tag. Custom Tag Dynamics (CTDYNE) inspirou-me para começar a modificar laser tag blasters, o que me trouxe-me informação sobre a modificações de Nerfs. 7th – There is someone or some group who inspired you? R: Yes, Urban Taggers and Custom Tag Dynamics. Urban Taggers inspired me to open Tactical Tag. Custom Tag Dynamics (CTDYNE) inspired me to start laser tag modifications, which eventually got me into Nerf modifications too. 8ª – Qual é o teu Nerfer favorito? R: Não tenho um, são todos muito fixes. 8th – Who is your favourite Nerfer? R: I don´t have one, they are all pretty cool. 9ª- És patrocinado por alguma marca de blasters? R: Sim, pela Xplorer Blaster Developments. 9th – Are you sponser for any blaster brand? R: Yes, for Xplorer Blaster Developments. R: Sim, Urban Taggers, Nerf Mods e Reviews and NerfWiki. 10th – Do you sponser anyone? R: Yes, Urban Taggers, Nerf Mods & Reviews and NerfWiki. 11ª – Preferes prefer flyweel, normal priming (como o da recon), slam-fire, automática, semi-automática, pressão do ar ou outra? R: Eu prefiro normal priming com direct plunger. 11th – Do you prefer flyweel, normal priming (like the recon), slam-fire, fully automatic, semi-automatic, air pressure or other? R: I prefer normal priming with direct plunger. 12ª – Pertences a algum grupo de Nerf? R: Sim, pertenço a Omaha Nerf League. 12th – Do you belong to some Nerf group? R: Yes, I belong to Omaha Nerf League. 13ª – Tu jogas HvZ? R: Não. Eu gostava que houvesse um grupo por aqui que jogasse HvZ. 13th – Do you play HvZ? R: Nope. Wish there was a group around here that did it! 14ª – Tu jogas NIC? R: Não. Não existem blasters de NIC no meu grupo. 14th – Do you play NIC? R: Nope. I just run games on my own. No “NIC” blasters in our group, though. 15th – Preferes N-Strike, Vortex, N-strke Elite, Dart Tag, N-Force ou Lazer Tag? R: Eu prefiro Lazer Tag para exterior e N-Strike Elite para interior. 15th – Do you prefer N-Strike, Vortex, N-strke Elite, Dart Tag, N-Force or Lazer Tag? R: I prefer Lazer Tag for outdoors and N-Strike Elite for indoors. 16ª – Existe alguma blaster que queria ter e não tens? 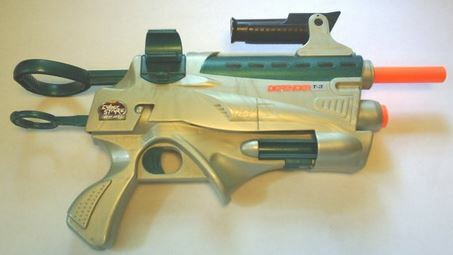 R: Sim, a Nerf Defender T3. Quando eu era mais novo, um amigo meu tinha uma que eu gostava de usar. 16th – There is some blaster that you wanted to have and you don´t have? R: Yes, the Nerf Defender T3. A friend of mine when I was younger had one that I LOVED to use, but I always had to borrow it. 17ª – Tens alguma Nerf clássica? 17th – Do you have some vintage blaster? 18ª – Qual é a pior blaster de todos os tempos? R: A Speedswarm. O ranges são óptimos, a blaster é muito lenta a disparar e faz um ruído muito alto , por isso é que eu nunca a usava durante um jogo. 18th – What is the worst blaster of all time? R: The Speedswarm. While it has great range, as a blaster with it’s slow Rate of Fire and just the loud, poorly geared motor running it, I would never use one during a game. 19ª – Como é que guardas as tuas Nerfs? 19th – How do you store all of yours Nerf guns? 20ª – Qual foi o máximo que pagaste por uma Nerf Blaster? R: Eu paguei $56 pela Nerf N-Strike Stampede quando saiu. 20th – What was the max that you paid for a Nerf blaster? R: I paid $56 for the Nerf N-Strike Stampede when it first came out. Kind of felt silly since they went on sale a few weeks later! 21ª – Quando começaste o teu blog? R: Eu comecei em 15 de Abril de 2011. 21th – When do you start blogging? R: I started blogging at April the 15th, 2011. 22ª – Gostas do meu blog? 22th – Do you like my blog? Eu gostaria de agradecer ao Bazookafied pela colaboração. Não te esqueças de visitar o blog dele e pôr like nos posts que gostares. Também não te esqueças de subscrever o meu blog a gostar deste post! I would like to say a big thanks to Bazookafied for the collaboration. Do not forget to visit his blog and put like in all posts that you like. Don´t forget do subscribe my blog and like this post! This entry was tagged Bazookafied, Big Bad Bow, Bow ´n Arrow, Custom Tag Dynamics, Elite, Elite Longshot, Interview, Laser Tag, Lazer Tag, Longshot, Masterkey, Nerf, Nerf Defender T3, Nerf Mods & Reviews, Nerf Mods and Reviews, Nerf Nation, Nerf Wiki, Omaha, Omaha Nerf League, Solscud, Speedswarm, Stampede, Strongarm, Tactical Tag, Urban Taggers, Xplorer, Xplorer Blaster Developments. Bookmark the permalink. Your style is very unique in comparison to other people I’ve read stuff from. I appreciate you for posting when you have the opportunity, Guess I will just book mark this web site. it’s good to read this weblog, and I used to pay a visit this web site daily. Dear Author, This is really a good post but do you have some more information about the topics you raised? lovers but this paragraph is genuinely a nice article, keep it up.